Lacking health insurance and diagnosed with Hodgkin’s lymphoma in 2011, Shawn quickly accrued a massive medical debt that he did not have the ability to pay. That’s when New York Times best-selling author Terry Brooks offered to donate a short story that Shawn could sell tohelp alleviate those bills―and suggested he ask the same of his other writer friends. With the help of stalwart friends and these wonderful short stories, Shawn has taken the gravest of life’s hardships and created something magical. 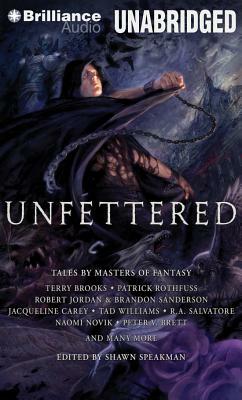 Unfettered is not only a fantastic anthology in its own right, but it’s a testament to the generosity found in the science fiction and fantasy community―proof that humanity can give beyond itself when the need arises.